BERKELEY, Calif. — The Chilean artist Cecilia Vicuña is having her first US–based survey at the Berkeley Art Museum and Pacific Film Archive (BAMPFA). But “retrospective” doesn’t ring quite right for an artist whose work disrupts linear time. And “work” doesn’t ring quite right for an aesthetic that emerges from its own dematerialization. Organized by the Contemporary Arts Center, New Orleans and co-curated by Andrea Andersson and Julia Bryan-Wilson, the show, titled Cecilia Vicuña: About to Happen, features site-specific installations, a selection of short films, artist’s books, and over 100 precarios — precarious pieces that verge on disintegrating. This sensory show is at once dazzling — merging text with textile, the avant-garde with the ancient — and dooming in its conjuring of displacement, one endemic to ecological destruction in the wake of colonial occupation. “Undoing completes the doing,” Vicuña writes in the catalogue. As unassuming as a stick planted along the shoreline, los precarios are plotted into landscapes where wind or water will wash them away. Bound by bone, shell, and thread, these small sculptures are made of feathers and pebbles, seeds and beads; their marrow is driftwood and tumbleweed. Here a cross, there a swirl — a feather frozen in flight, a tangled attempt at ignition. These balancing acts cast shadows that sway. “We are made of throwaways and we will be thrown away,” writes Vicuña. Perhaps that is why a raft floats, suspended from the ceiling of the second gallery. “Balsa Snake Raft to Escape the Flood” (2017) is a site-specific installation that features debris scavenged from the Mississippi coast of New Orleans, where the exhibition made its debut. “The Flood” at once evokes Hurricane Katrina, the BP oil spill, and a biblical deluge snaking through its base. And yet, the raft also promises “escape.” A voyage emerges from the wreckage, and from the refuse, a reclamation: Vicuña’s work commemorates calamity while transfiguring its ruin into another tomorrow. Born in Santiago de Chile in 1948, as a teenager Vicuña would begin fusing feminist art praxis with indigenous tradition, performance with conceptual art, and art objects with an outpouring of poetry. Though her early work dialogues with the promise of a socialist Chile, when she went to pursue an MFA in London, she would remain there, exiled by the dictatorship of Augusto Pinochet, which extended from 1973 to 1990. In exile, Vicuña would craft many modes of political resistance, ranging from over 400 precarios to quipus (“talking knots”), Incan record-keeping devices woven from colored wool and punctuated by knots. Created especially for the BAMPFA exhibition, Vicuña’s “Burnt Quipu” (2018) evokes smoke through its filaments, alluding to forest fires from California to the Amazon to the Boreal Forest to Chile and beyond. Textual textiles, the quipus were once read by touch. Vicuña seeks to wrest art from its fixed position of belonging in museums, a well-rehearsed avant-garde move against institutionalization. Perhaps more unique, however, is her dialogue with the sea, earth, and dunes, with the dislocated and the dispossessed. Her work weaves thread through communities: from New Orleans to the Bay Area, from Santiago to London, from the river Aconcagua to the Mississippi. “We can simultaneously be time- and space- bound while completely free,” Vicuña maintains, “I am constantly faced with that double capacity.” The exhibition experiences that tension between being tethered to time and place, and boundless in a continuum: to be displaced and placed, dispossessed and possessed. Vicuña’s gesture toward the environment is both ancient and forward-dawning, touching a form of awareness from which change might emerge. 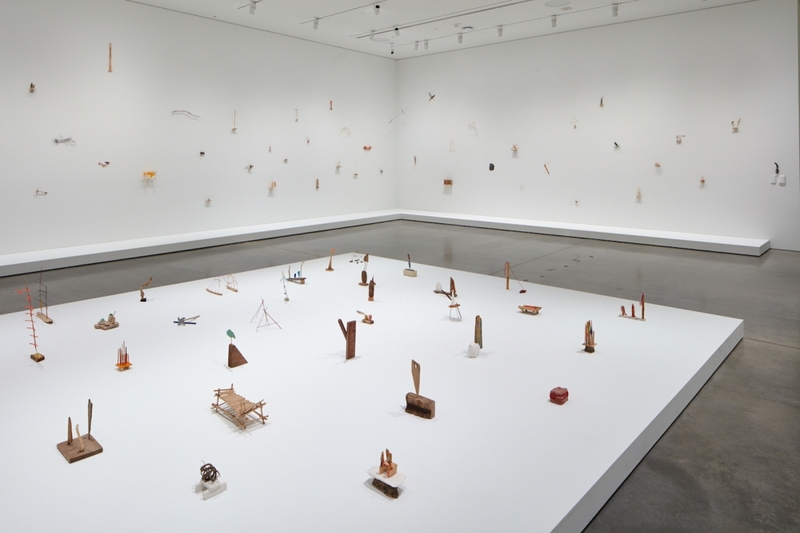 Cecilia Vicuña: About to Happen continues at the Berkeley Art Museum and Pacific Film Archive (2155 Center Street, Berkeley, California) through October 14.